e' sweet moment comes with this bouquet too!! 1) We are a homebase buss, therefore all the meet-up is for further CONSULTANCY and its an upon appoinment ONLY. 2) All basic enquiries, pls thru whatsapp. 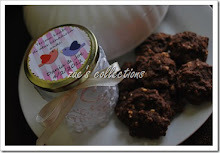 Zue's Collections the subsidiary of PROFEZ HOLDINGS SDN BHD was in business since end of 2006. Since then, Zue's Collections start to grow from one order to another. Until today we have received more than 50 orders through out Malaysia (Selangor, Kuala Lumpur, Negeri Sembilan, Pahang, Melaka, Johor, Terengganu, Pulau Pinang, Perak and also Kedah) and Singapore. Believe it or not, we always deliver the order on time. And believe it or not, some of our customer come all the way from as far as Kedah to KL just to pick it up (THANK YOU VERY MUCH). 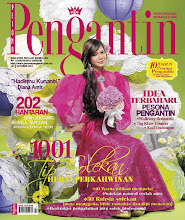 The owner, Puan Zuraihan Abu Bakar always try new things in her decoration. 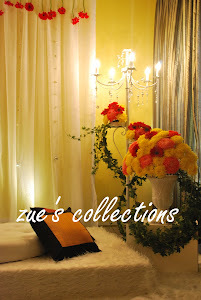 At Zue's Collections, we always consider the best for the customer. To be honest we start the busniess from our home. 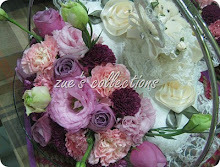 However, soon, Zue's Collection is planning to open a display shop and consultancy for wedding gift decorations. We always consider ourselves small company and try to expand from time to time plus giving better price and budget for our customer. 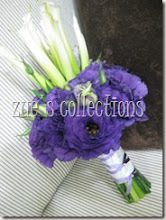 Currently we only deliver for FREE (Wedding decoration order ONLY) in Selangor and Kuala Lumpur. With good wishes and prayers from all, hopefully we can expand the delivery to other states. Our business concept is the earlier you book the better price you get. Due to short of hands, we can only manage to cater 10 order in a month. Therefore, we are so sorry if we cannot accept your order from time to time. We always care about the quality rather than quantity. Thats will be our satisfaction. Current services that we have is to provide wedding gift decoration includes "bunga paha", "bunga telor", gifts decorations, hand bouquet, make up and all that we have showed here in the blog. For now we do not have the wedding dress and "Pelamin". However, we will announce any new services in the blog for customer information. We also supply the guest gifts which is currently bunga sabun. We are looking forward for more new things for customer to choose. Do not worry, because we keep make you happy on the wedding day. So, please do not hesitate to contact us for any inquiry on the product that we have in house.